Doctors without Borders (MSF) is under investigation over allegations it facilitates illegal immigration as debate rages in Italy following accusations, backed by the government, that NGOs are colluding with Libyan people smugglers. Italian newspaper Corriere della Sera reported that Italian prosecutors have begun investigating MSF for rescuing migrants stranded at sea allegedly without notifying Italy’s coast guard. MSF crew are accused of telling migrants not to cooperate with Italian and EU border authorities during “debriefing” when they arrive on land, according to the newspaper. Investigating Sicilian prosecutor Ambrogio Cartosio told the Senate Defense Commission on Wednesday that several members of multiple humanitarian organizations are under investigation on suspicion they may be working with people smugglers. The newspaper, however, stated that the prosecutor didn’t state the name any particular NGO. "The Trapani prosecutors' office has current investigations concerning the possible crime of abetting illegal migration focused not on NGOs per se, but individuals belonging to NGOs," he said. Migrant rescue charities in the Mediterranean have been under intense scrutiny in recent weeks with the Italian government backing prosecutors’ claims “100 percent” that Libyan traffickers and rescuers were in contact, offering a “taxi” service bringing migrants to Italy. Prosecutors have made claims that rescue boats turned off their transponders and turned on lamps to show migrant boats their location. Before the parliamentary committee, Cartosio reiterated this claim, saying some rescue crews appeared to know where to find boats of migrants in advance. "People aboard the ships are clearly aware of the time and place where they will find vessels carrying migrants, so they are clearly previously informed," he said. "We understand that NGOs made some rescues at sea without informing the Coast Guard," Cartosio said. "Their presence in a given part of the sea, is strong circumstantial evidence that suggests they are aware that this is where sea vessels arrive,” he added. “But it alone is not a decisive element in determining the crime of illegal immigration." In some cases, “humanitarian ships came into Libyan waters and carried out relief without consultation with the Coast Guard,” Cartosio was cited as saying by another Italian newspaper, La Repubblica. “We have evidence that [those] aboard know in advance where and when they will reach the migrants." MSF responded to the allegations, saying it had no contact with prosecutors but that it is ready to explain its work in the Mediterranean. “We confirm that we were not contacted by the Trapani attorney (Cartosio), and we reiterate our availability to clarify any information required by the authorities and strongly reaffirm the total legitimacy and transparency of our work in the sea, the only goal of which is to save lives,” it said. The route from Libya across the Mediterranean to Italy is one of the most commonly used by human traffickers bringing migrants and refugees from Africa and the Middle East to Europe. The UN High Commissioner for Refugees (UNHCR) reports over 24,000 migrants have made the journey from Libya to Italy in the first three months of 2017, an increase of 6,000 from last year. 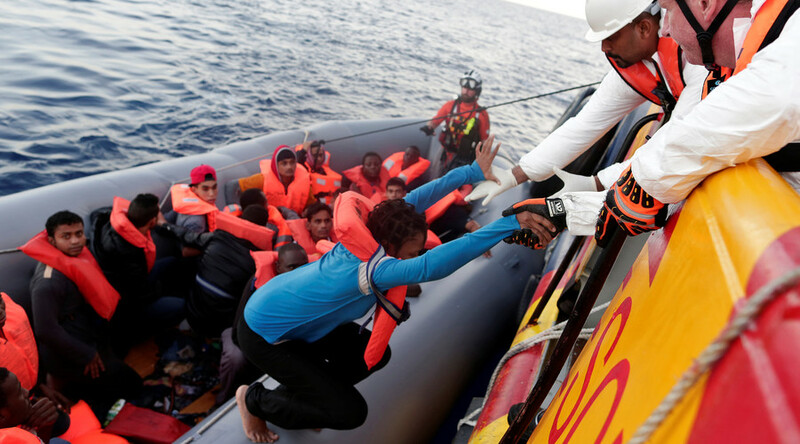 Some of the organizations involved in migrant rescue include Doctors Without Borders (Medecins Sans Frontiers), SOS Mediterranee, Save the Children, and Malta-based Mobile Offshore Aid Station (MOAS). All have denied allegations that they are colluding with people traffickers.